Keurig Green Mountain, Inc., the International Center for Tropical Agriculture (CIAT), and the Agroecology and Rural Livelihoods Group (ARLG) of the University of Vermont, announced today the results of a 2013 scientific study entitled Thin Months Revisited.This report presents results from a household livelihoods study of smallholder coffee farmers in four sites of Nicaragua, Guatemala and Mexico. The research was conducted in 2013 and represents a longitudinal revisit of the same households from a study conducted by the International Center for Tropical Agriculture (CIAT) in 2007. The 2013 results show advancements in food security since 2007, which can be attributed to investments in initiatives such as crop diversification. To read the study, visit the Resources tab in English or on the Recursos en Español tab in Spanish. Many of you remember that a research study conducted by the International Center for Tropical Agriculture (CIAT) is what spurred the creation of this film and this effort to educate the coffee industry about seasonal hunger in the coffeelands and engage them to act. Now, 5 years later, we are revisiting that study. The team headed back to Nicaragua, Guatemala, and Mexico to see what has changed over these last few years. The original survey of small-scale coffee farmers found that over 67% of farmers were unable to maintain their normal diet for 3-8 months of the year. We returned to learn if life has changed for these farmers. We want to know, and we are sure you do to, has the period of “the thin months” shrunk? To revisit the original study findings, check it out on the Resources tab in English or on the Recursos en Español tab in Spanish. April 2013 marked the 25th annual Specialty Coffee Association of America (SCAA) conference; the largest specialty coffee conference in the world which recently took place in Boston. Amongst the event’s highlights was the work of Pueblo a Pueblo, a non-profit organization focused on improving the lives of indigenous Guatemalans and this year’s recipient of the Sustainability Award in recognition of their Organic School Garden project in Guatemala. The award honors individuals and organizations, within the specialty coffee industry, working to create substantial positive change through projects that promote sustainability. The Organic School Garden project in Guatemala seeks to improve the lives of those living in coffee growing communities in Guatemala though strengthening food security at the household level and diminishing malnutrition levels for school-aged children. In 2012, 1,151 children attended weekly garden activities and 86 teachers and directors received trainings on organic agriculture techniques. This project has been complimented by school initiatives, including incorporation of the produce harvested from the organic school gardens into school lunches. In addition, the provision of a daily meal has increased school attendance, students’ learning capability and improvement in the overall health of participating children resulting from the increased diversity of food in their diet. This week is the 25th Specialty Coffee Association of America’s (SCAA) conference; the largest coffee conference in the world where there is a lot to explore. Amidst the extensive variety of workshops offered, there are some specifically designed around the topic of food security. The workshops will cover information ranging from la roya (mentioned in Friday’s post, below) to the development of school gardens, all affecting small scale farmers in the coffee industry. Below are some recommendations to help you navigate through food security-focused workshops during this jam packed event! If you work with coffee farming communities, or if you have an avid interest in coffee, by now you have coffee leaf rust, or “la roya,” which has caused significant losses to the coffee harvest in Central America. Reports estimate a loss of 20% of the Central American crop this year due to the fungus, and predict a drop upwards of 40% next year. States of emergency have already been declared in Guatemala, Honduras, and Costa Rica and Nicaragua and El Salvador do not seem far behind. Coffee leaf rust represents a perilous loss of income for small-scale coffee farming families who are largely reliant on the income earned from coffee and struggle to meet their basic needs during much better times. In February, the Sustainability and Coffee Departments at Green Mountain Coffee Roasters, Inc. (GMCR) teamed up to conduct a survey of our supply chain partners to learn about how rust was affecting producers in their network and to understand the household-level impacts of the rust epidemic. In 111 survey responses, they learned about the extent of infection, common approaches to treat and prevent the fungus, and the toll that the outbreak is having on vulnerable families. The coping strategies mentioned included pulling children out of school to save on school expenses, eating less expensive and nutritious foods, and migrating to urban centers where there may be more opportunities for a better life – real or perceived. Read a summary of the survey results here. GMCR has invested significantly in projects to reduce the window of los meses flacos or “the thin months” of food insecurity. 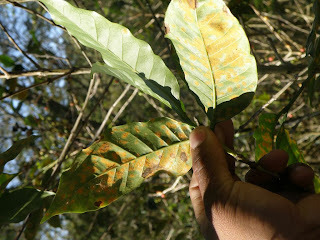 The pervasive opinion in Central America is that the thin months will be longer and more difficult during the next 2-3 years as a result of the coffee rust. GMCR's food security focus predates this roya epidemic; they know their investments are helping build resiliency for shocks in the coffee system like coffee rust. These interventions will become even more important as farmer’s primary livelihood is at risk, and will contribute to alleviating a humanitarian crisis. While much of the coffee industry and producer networks will be focused on renovation as a response to rust, the Sustainability team at GMCR will continue to advocate for enhanced farm plans that include diversified income sources and food production to reduce over reliance on coffee and promote family food security when prices or production are low. We're very happy to share the following Press Release from Coffeelands Food Security Coalition! Learn more about the Coffeelands Food Security Coalition visit Mercy Corps' Website. In a bold move to fight seasonal hunger in coffee producing countries, five coffee industry leaders – Counter Culture Coffee, Farmer Brothers, Green Mountain Coffee Roasters, Inc. (NASDAQ: GMCR), Starbucks Coffee Company (NASDAQ: SBUX) and Sustainable Harvest Coffee Importers – have come together to form the Coffeelands Food Security Coalition. In partnership with the global humanitarian organization Mercy Corps and the Nicaraguan organization Asociación “Aldea Global” Jinotega, these companies will help coffee farming families in Jinotega Department – the source of 60 percent of Nicaragua’s coffee – combat seasonal hunger. The three-year Empowering Food Secure Communities program will work with 150 women and their families to help them improve farming and business techniques, develop additional sources of income through home gardens and diversified crop production as well as engage more effectively with local government to provide assistance to the hungriest families. Increased crop yields and diversified economic opportunities will support household consumption during the “thin months,” and will allow farmers to earn more income by selling surplus produce in the local market. Farmers will participate in educational sessions on financial literacy, pest management, crop rotation, micro-irrigation, water and soil conservation, as well as proper storage and handling techniques. The Empowering Food Secure Communities program will also strive to achieve gender equality in the traditionally male-dominated culture by promoting gender education, improving women’s access to credit and identifying business opportunities at local markets. The work in Jinotega also has an important disaster risk reduction component. According to the 2011 Global Climate Risk Index (CRI) report, Nicaragua is the fourth most vulnerable country in the world to weather-related disasters like droughts and hurricanes. These disasters can cause massive crop destruction. To adapt to and mitigate this severe weather, Mercy Corps and Aldea Global will teach farmers ways to better prepare for natural disasters. “Climate-smart” gardens will allow women to conserve water for crop irrigation during dry periods, as well as protect crops from pest infestation and bad weather. The Empowering Food Secure Communities is the inaugural project of the Coffeelands Food Security Coalition. The alliance is committed to bringing awareness to the issue of seasonal hunger and plans additional projects in other coffee producing countries and communities. For more information, visit: www.mercycorps.org/Coffeelands. Asociación “Aldea Global” Jinotega was formed by 22 small-scale farmers in 1992. Together small-scale farmers, leaders in services and profitable agricultural businesses, are working in harmony with God, the environment, social responsibility and gender equity to be instrumental in the progress of Nicaragua’s rural families. Today, Aldea Global has grown to 1,429 active members. The Coffeelands Food Security Coalition is a new, collaborative project of leading companies in the specialty coffee industry that aims to develop, enable and disseminate solutions to seasonal hunger in coffee producing countries. Mercy Corps helps people turn the crises they confront into the opportunities they deserve. Driven by local needs, our programs provide communities in the world’s toughest places with the tools and support they need to transform their own lives. Our worldwide team in 41 countries is improving the lives of 19 million people. For more information, see www.mercycorps.org." The world of coffee is complex. In between when the coffee bean is picked and you eagerly brew your cup of coffee, there is a long chain of processes and people that have to come together to make it all happen. It is relatively easy for the consumer to imagine the production process from importer or roaster on, but far more challenging to envision, or try to relate to, the farmer that harvested that coffee. You already know about “los meses flacos” or “the thin months” and what they represent: a period of food scarcity that is commonplace among isolated rural farmers globally. It is not unique to those who grow coffee, but appears to be a frequent occurrence for smallholder coffee farmers who have limited land holdings and have weighted their land-use investment toward the coffee cash crop. As you read the policy brief, we invite you to let us know what’s on your mind. Send us any questions or comments that you may have through our Contact Us page.